Just realised that the one recipe I have been consistent with every year is that of a Christmas Special treat. Guess it’s all about the feel good factor that Christmas gets with it. Plus, there are so many traditional, non-traditional, unheard, famous, etc recipes out there for Christmas which have always intrigued me. This year I bring to you a fudgy, gooey, chocolaty recipe (totally my kind) of Brownie Tart which has been baked in an Oats Crust. Now, the main aim of this recipe has been to use my tart dish. I bought it nearly 6 years ago but haven’t managed to use it yet. So the 2 motivators for this recipe have been the unused tart dish and of course Christmas. This is not a traditional Christmas dish but yes a true celebratory dish in every sense for the happy occasion. I also recently received the Tupperware Smart Chopper and wanted to use it in an unconventional way. Yes, that’s me. I test products if they can ALSO do things besides what they are meant for. Not only did the chopper outshine in giving me finely minced vegetables and herbs but also it excelled in making the crust dough, powdering oats and helped in easing the process of mixing the brownie batter. Totally impressed! The manual chopper is designed smartly with sharp blades so you don’t end up putting in a lot of effort to use it. I like the anti-skid base which helps keep the product in one place and do its job well. The red hot colour is definitely an eye catcher. Its transparent container lets you gauge the texture of ingredients before opening the chopper. Time saving feature..I say. Now, coming to the recipe. It’s fairly simple. Make sure you follow the steps to the T. Be careful while melting the chocolate, it’s a tricky step. Also do not over bake the tart, the filling is meant to be gooey yet firm. Enjoy and Merry Christmas ! Step 1 – To make the Oat Crust, pulse the oats in the Tupperware Smart Chopper. Step 2 – Add in the remaining crust ingredients and pulse again till you get smooth dough. Step 3 – Remove the crust dough in dry container. Cover and refrigerate it for 15 minutes or till the dough is hard. Step 4 – Roll out the dough to 1/4th inch thickness and line it in the tart shaped baking dish. Press gently at the edges and cut extra dough at the circumference. Step 5 – Bake the tart shell in a hot oven for 10 minutes at 180 C. The idea is to half bake the tart making it firm enough to hold the filling. Complete baking of the tart will happen with the filling. Step 6 – While the tart bakes, start to prepare the tart filling. Melt butter and chocolate over a double boiler (keep the vessel containing chocolate- butter mixture over a pot of hot water. This is indirect application of heat) or microwave. Do not heat too much or else the chocolate will seize and be unfit for use. Step 7 – Beat eggs, sugar, Vanilla essence and salt together. 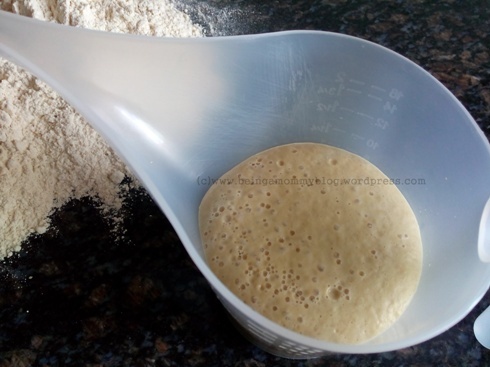 You can do this in the Tupperware Smart Chopper or in a bowl using whisk. Step 8 – Mix the eggs and chocolate mixture together. Gently mix in the flour. Step 9 – Once the tart is half-baked, remove from oven and pour the filling in it. Step 10 – Place the tart dish in the oven and continue baking at the same temperature for 25 minutes. Step 11 – Remove the baked Brownie Tart from oven. Cool and refrigerate for at least 15 minutes before serving. Step 12 – Remove the Brownie Tart from the baking dish and cut into wedges. You could dust the tart with powdered sugar for the snowy white effect to complete the Christmas feel!